€650 per person including 1 night at Berber Camp. Price based on two people travelling by private vehicle. The Atlas Mountains is a mountain range which stretches across northwestern Africa extending about 2,500 km through Algeria, Morocco and Tunisia and dissecting Morocco in two. The highest peak is Jebel Toubkal, with an elevation of 4,167 metres in southwestern Morocco. A circular route through the undiscovered Anti Atlas mountains in the south of Morocco starting and finishing at the coast. Allowing you to travel off the beaten path and include a night in the desert at Erg Chigaga Great Dunes, the Anti Atlas mountains region near Tafraoute is little-visited and the scenery throughout fascinating. Some of the highlights will include the Ameln Valley, the Ait Mansour Gorges, the Sahara desert and the Draa Valley. Be prepared to be on the move each day with a full itinerary. Your driver will collect you after breakfast at your hotel in Agadir. 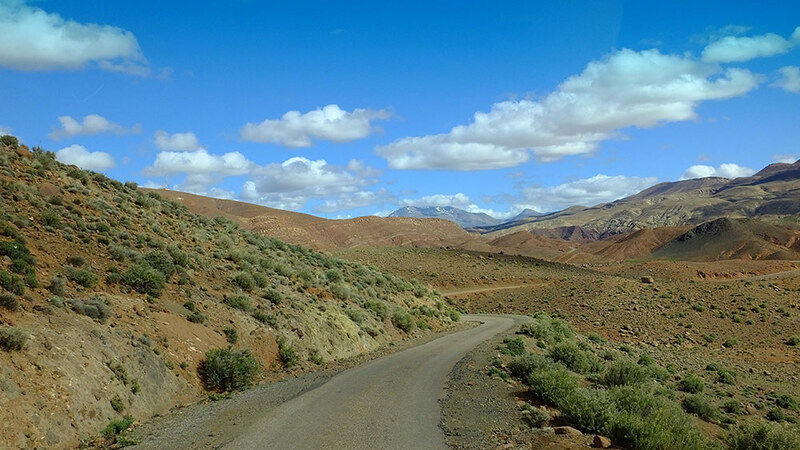 Today, drive south-eastwards to the Anti-Atlas mountain region near the town of Tafraoute. The route passes across the fertile plains of the Souss and Massa rivers, before reaching the town of Tiznit. On leaving Tiznit the landscape becomes ever more mountainous and you will gain height on winding roads, the highest peaks here are above 2000m. The terrain is wonderfully stark and rugged, with the occasional glimpse of palm oases and villages clinging to hillsides. The route eventually makes a descent to the town of Tafraoute. A short distance from there you will reach your guest-house in the picturesque Ameln Valley, at the base of imposing ochre-coloured rock walls. Take time for a short walk in the Ameln Valley in the late afternoon – the rocks change form and colour as the light conditions alter. Overnight in the Ameln Valley in traditional guest-house. After breakfast, drive over to the scenic Ait Mansour Gorges, one of the highlights of the area. The canyons make for an interesting short walk, with outlying small villages, palm trees, and colourful rock faces. From the Gorges, today’s route will take you eastwards to reach the town of Foum Zguid, frontier to the desert. The scenery continues to be dramatic and arid, interrupted by oases on dried river banks, and you will make part of the early stages of the day’s journey along a piste track. At Tata, the main road eventually joins the course of the Jebel Bani mountain ridges, which mark the northern boundary to the Saharan region you will be passing through over the next two days. Spend the night just outside the town of Foum Zguid, at a comfortable guest-house, anticipating tomorrow’s off-road drive across the desert. After breakfast, drive through Foum Zguid and then quickly leave the tarmac road behind, join a rough, stony track into the desert. Crossing hamada (desert stone) and enjoying the glorious scenery laid out before you (mountain spires, cliff faces, acacia trees, here and there palms), you will eventually reach an area of fossil beds. After stopping to collect some pieces, the rough track eventually evens out and softens, then crosses the vast dried salt flats of Lake Iriqui. Once on the lake, mirages are more apparent, as are dunes to the south-east. Leaving the lake bed, drive over sand, which deepens as it follows a dried river course. This ‘river’ brings you to the great dunes of Erg Chigaga where your desert camp is located. Arriving in the early afternoon, you will have plenty of time to take a guided camel-trek and walk to explore the dunes, before admiring the sunset close to camp. After dinner, enjoy traditional music by the fire-side. Overnight at camp. Wake early to watch the desert sunrise and take breakfast at camp. Aim to leave camp around mid-morning. You will exit the desert in the opposite direction to the previous day, continuing across the desert terrain eastwards for 2 hours, to join the road at the village of Mhamid. Again, the scenery changes within a short distance and offers a variety of desert flora, rolling dunes, plateaux and hamada, a quite different perspective on the Sahara to yesterday. 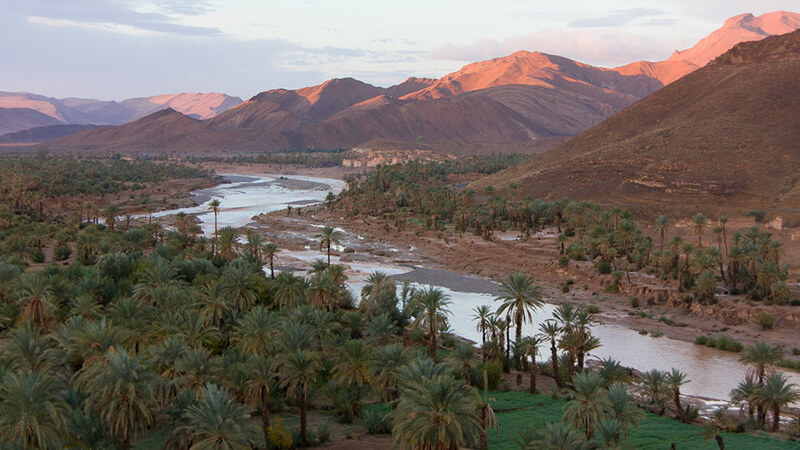 Once at Mhamid, we join the course of the magnificent Draa Valley, which we follow for the rest of the day. 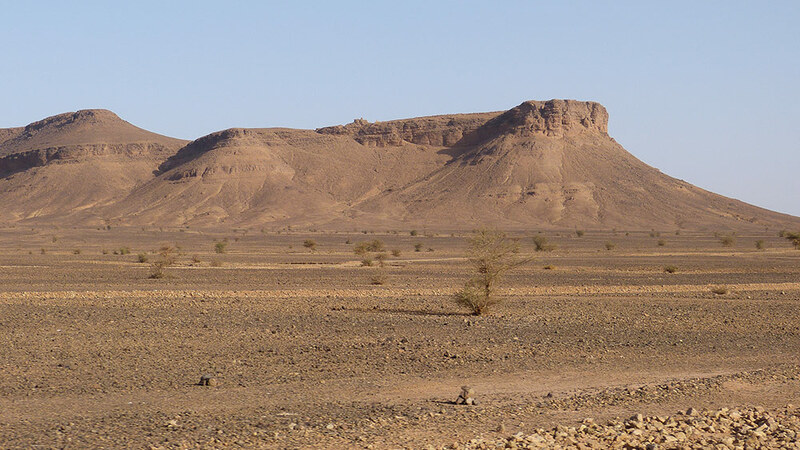 The Draa is flanked by vast palm oases, crumbling kasbahs and the Anti-Atlas ridges. Along the route, make time to visit Tamegroute and Tamnougalt ksars (earth-constructed dwellings). You end the day’s drive at the palm grove of Agdz, spending the night there at a charming kasbah-style guest-house. Today, complete the circuit via the Anti-Atlas chain to reach your start point at Agadir. 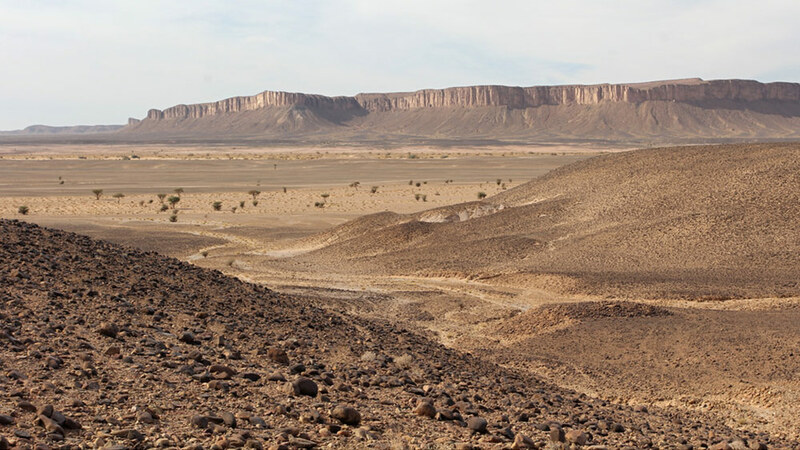 The route from Agdz to Agadir will pass through the towns of Tazenakht and Taliouine (the gateway to the Jebel Sirwa region) before leaving the Anti-Atlas mountains behind to descend onto the Souss River plain to pass Taroudant. guided camel-ride out from camp.